Sunland Village has two swimming pool complexes: South Pool at 4546 E. Delta Ave. and North Pool at 510 S. Quinn Street. Swimming pool hours are 7:00 a.m. until 11:00 p.m., seven days per week. The South Pool Complex includes two pools, one jacuzzi and 1 spa. The North Pool Complex includes one L-shape pool and one jacuzzi. 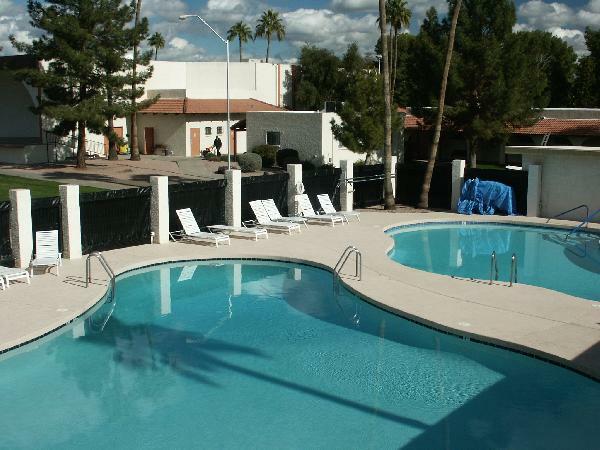 A Sunland Village Key Fob will be used by members and guests at all times for access to either pool complex. Water Aerobics Exercise taught by Sunland Volunteer from 9 a.m. to 10 a.m. No charge. Water Volleyball from November to April on Sundays from 1-3 p.m.
Water Volleyball from May to October, Monday and Thursdays from 5:30-7:30 p.m.
South Pool: 4:00 to 6:00 p.m.
North Pool: 10:00 a.m. to 12 p.m.
1. Everyone must shower before entering pools or spas. Do not use soap or shampoo. blisters or other acute or obvious skin or body infections shall be excluded from the pools. 3. If incontinent, wear a swim diaper. 4. Use waterproof and oil-free sun blockers only. No lotions or oils. 5. No smoking in pool area, dressing rooms or ramada area. 6. Food and drinks are allowed under ramada only. No glass containers allowed in pool area. the ramada for their safety. North Pool from 10:00 a.m. to 12:00 p.m.
9. You must be 18 years or older to use the spas. 10. No diving, jumping, running or horseplay in spas, pools or pool area. 11. The spas are at a higher temperature and extended use may be harmful to your health. 12. Keep gate closed – do not prop open. weights, and kickboards may be used. 14. Inflatable items are not allowed in the pool area except as noted in Rule 15. 15. Inflatable armbands and vests may be used for children’s safety. 16. No other toys or paraphernalia are permitted. 17. Members are responsible for their guests and must insure that all rules are obeyed. purchased at the Sunland Village Office. 19. Activity card and privileges may be suspended for violations. Refer to the Policy Manual Section XIV Swimming Pool Rules on page 25-26 for a complete list of rules, policies and safety requirements.